Decorate up to 8 can coolers at once. Be fully prepared to decorate can coolers, popular for commemorating parties and events and as promotional giveaways. 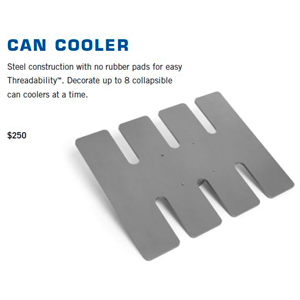 With sturdy steel construction, the Can Cooler Platen can decorate up to eight can coolers at once. With no rubber pads on the platen, it's easy to dress, decorate, and undress can coolers. Platen measures 16" x 20" x 5" and fits 16" x 20" Hotronix and MAXX heat presses.